» Gill Smith makes a strong showing in the Sheppey East By-Election. Gill Smith makes a strong showing in the Sheppey East By-Election. 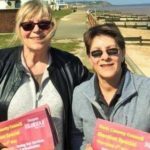 Gill Smith (pictured with Sheerness Councillor Angela Harrison) came a valiant second in yesterday’s Sheppey East By-Election. Gill polled 338 votes (30%, a 16% rise in voter share) against 522 for the Tories and 235 for UKIP. The Lib Dems got a rather pathetic 23. The increase in voter share was thanks to the work of over 60 volunteers from Sittingbourne, Sheppey and 7 other constituences from around Kent. Gill has determined to carry on and prepare the ground for next year’s full Borough Elections.